You can see the GPS tracks for this entire hike. From the Glacier Gorge Trailhead, we started hiking at 9:44. After the 2nd creek crossing, we turned right onto a cutoff trail, which took us to the Mills Lake Trail near its intersection with the Lake Haiyaha Cutoff Trail. We took the Mills Lake Trail south to its crossing over Icy Brook, then departed the main trail, turning right onto a faint trail which begins on the south side of Icy Brook. This trail soon faded out as we headed south, up the base of Thatchtop. Further up, we found rock cairns, which we generally followed as began our ascent of the S-shaped couloir. The couloir is steep with lots of loose rock. Above the couloir, we soon reached alpine meadow interspersed with boulder fields, and made a beeline south for the summit. We reached the Thatchtop summit at 12:06, with the odometer at 3.22 miles. 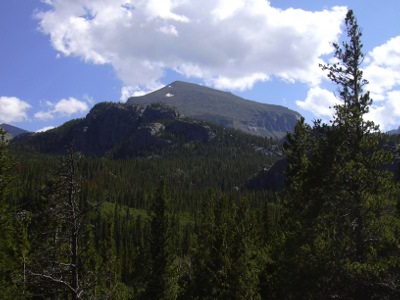 The summit has spectacular views of Glacier Gorge, Longs Peak, Keyboard of the Winds, Pagoda, Chiefs Head, McHenrys Peak, and the Arrowhead. We did not find a register on the summit, and a cold wind prompted us to start making our way south to Solitude Lake. From Solitude Lake there is a beautiful view toward Powell Peak and the Powell Glacier. Descending from Solitude Lake, we headed to Shelf Lake, and then took an unofficial trail down to the Black Lake Trail. We returned to the Glacier Gorge Trailhead at 16:00, with the odometer at 8.7 miles. This hike took 6 hrs, 16 minutes, with an elevation gain of about 3,500 feet.